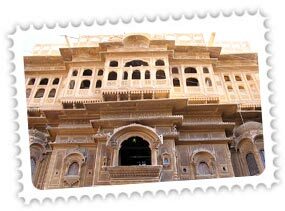 Jaisalmer fort, Manak Chowk and the Havelis. 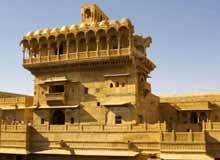 Rising like a sunbeam from the golden sands of the desert, Jaisalmer Fort is the second oldest fort of Rajasthan. A sight to behold, this living fort is one of the marvels of Rajasthani Architecture, especially of the stone carver's art. Unusaual and mystic! It is a Salim Singh ki Haveli. The top most storeys of this haveli are destroyed yet the surviving structure has peerless grandeur. You indeed would be enticed with the intricate workmanship and designed Jharokhas. Nathumal Ki Haveli is two identical looking portions which are combined by a common facade. The projected balconies are the sheer example of Jeweller's art applied to stone carvings. The origin of this artificial water tank dates back to 1156 AD. Surrounded by small temples and shrines, it also gives a view of the exquisite archway, Teelon ki Pol - one of the main entrances to the lake and the city. Sam Sand dunes are the major attractions of Jaislamer. It is 3 kms long and 1 km wide and is half a kilometer high. The sam sand dunes are unreliable and they are picturesque. 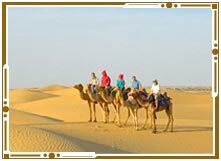 Sam Sand dunes are just the place to surf the golden sands of Rajasthan through a safari. Located at a distance of 40 kms from Jaisalmer, Desert National park is a perfect example of unusual ecological bio diversity. 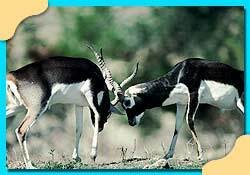 Thar desert is the teeming with wildlife and have some resident species which include Chinkara, Hare Desert fox, black buck, wolf and desert cat. This is a 300 year old Jaisalmer Haveli. It has a beautiful blue cupola roof with carved brackets in the form of peacocks. This is an amazing mansions in yellow stone and has an amazing projecting balcony on the top storey. 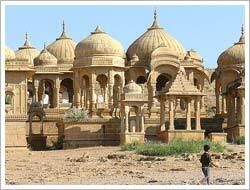 Shopping in Jaisalmer is a great way to experience the beauty of the state. There are some major shops inside the fort which include Sadar Bazaar, Sonaron ki Bass Manak Chowk, Pansari Bazaar, Gandhi Darshan, Seema Gram and various Rajasthani Govt Shops. The city is well connected by flights which move from to and from New Delhi, Jodhpur and Jaipur. 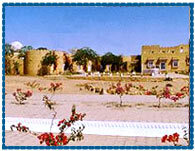 The major airport, Jaisalmer airport lies in the cantonment area which is 5 kms away from the city centre. It is generally managed by the Indian air force. 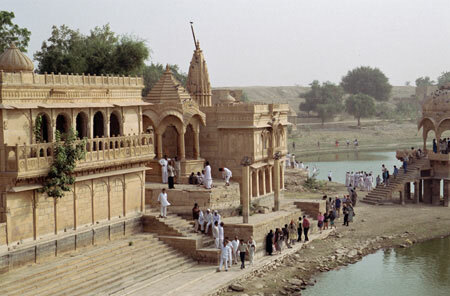 Jaisalmer is connected by a daily trains to Jodhpur. The city is majorly connected by Agra, Jaipur, New Delhi, Mumbai and many more. Just a 10 min drive from Gadi Sagar Pol. 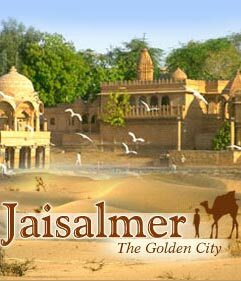 aisalmer is connected to all major cities of Rajasthan such as Bikaner, Jaipur and Jodhpur. Its main bus stand is situated near the railway station. All major busses move from Bus depot to city centre.